Quiet room with well equiped kitchen. Excellent Wi-Fi. Hotel is in 5-10 minute walk from the beach and restaurants. Beach is perfect, with plenty of space and shade from trees. There is a big Eroski supermarket in 10 minute walk. Baby bathtube was provided to us which was very helpful since we traveled with 4 month old son. All our requests (iron, bowl for salad, extra bed linen) were addressed within a few hours. Good mountain view from our room on the third floor. No issues with parking next to the hotel. Location is good. Pool was nice. Shower in room was good. This is a nice 3-star hotel. It all works but it not exceptional in any way. The standard of the food was not impressive though! Loved the pool, staff and kids entertainment times. The hotel cleanliness was great and the room got tended to everyday. 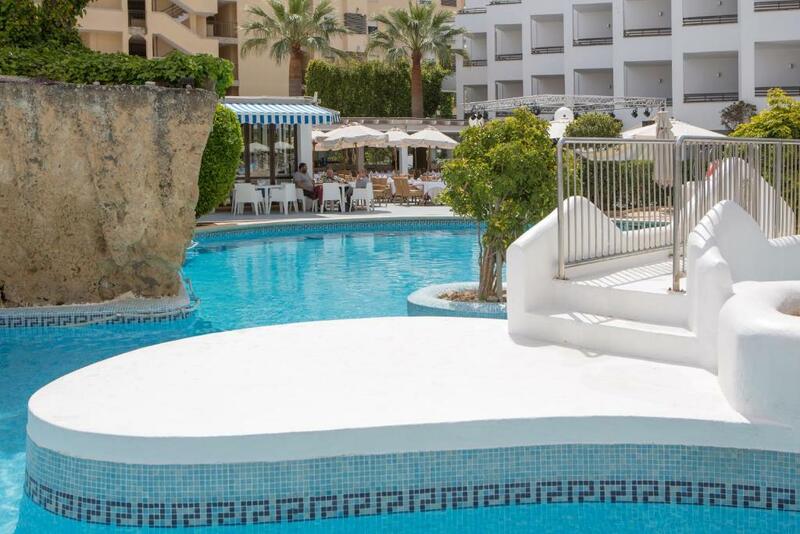 Lock in a great price for Plazamar Serenity Resort – rated 8.3 by recent guests! Plazamar Serenity Resort This rating is a reflection of how the property compares to the industry standard when it comes to price, facilities and services available. It's based on a self-evaluation by the property. Use this rating to help choose your stay! 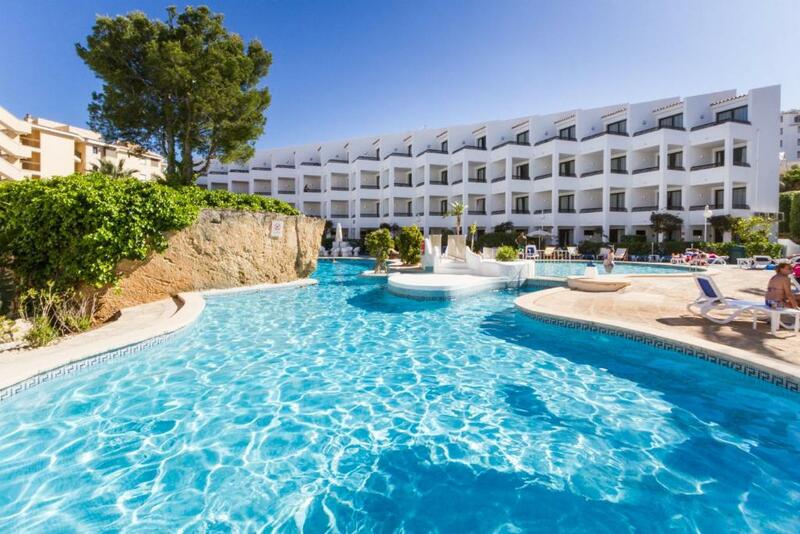 One of our top picks in Santa Ponsa.Located 1,500 feet from Santa Ponsa Beach, Plazamar Serenity Resort offers a lagoon-style pool surrounded by palm trees and sun loungers. Each bright studio has a kitchenette and a balcony with pool or mountain views. 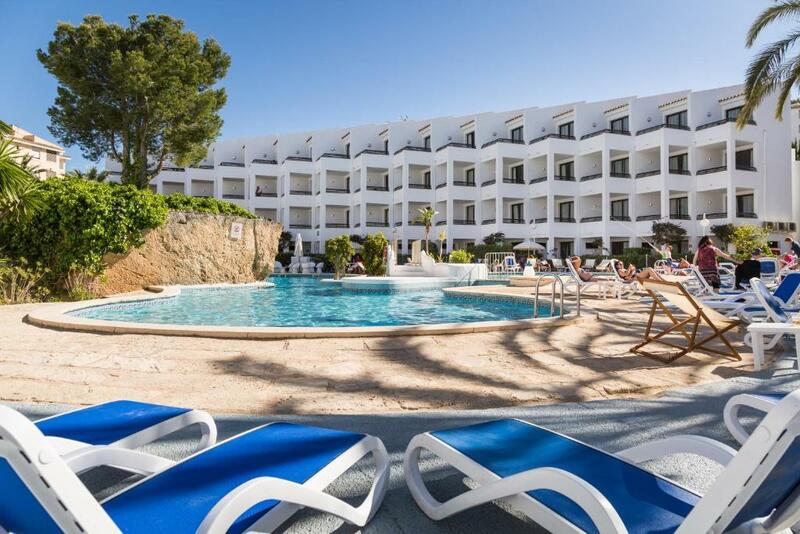 Plazamar Serenity Resort are located in the popular Mallorcan resort of Santa Ponsa. A wide range of shops, restaurants and bars can be found within a 5-minute walk. Each air-conditioned Plazamar Serenity Resort studio has a sofa bed and a dining table. The kitchenette includes a microwave, fridge and kettle. Free WiFi is available at the property's lobby. You can enjoy international meals in the café or at the poolside snack bar. There are weekly barbecues in summer. The complex also offers daily entertainment and activities for all ages. You can arrange car or bicycle hire at the 24-hour front desk. Staff can also provide information about the island. 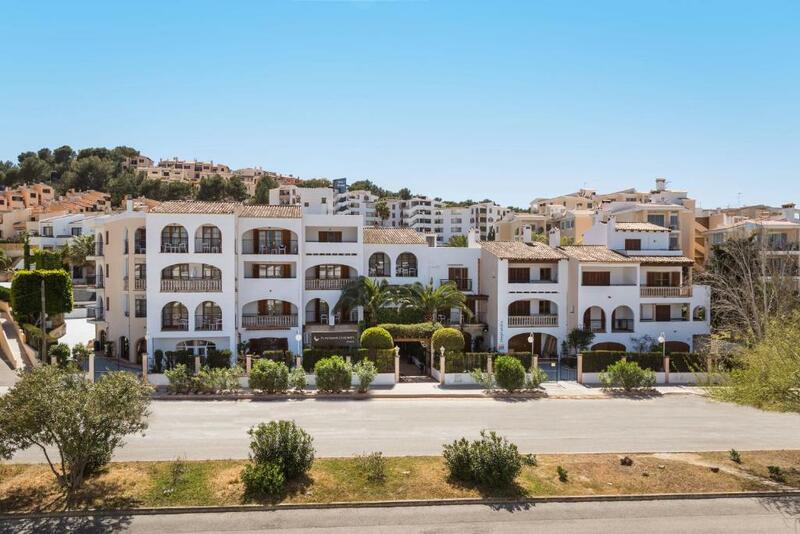 뀐 Located in the top-rated area in Santa Ponsa, this property has an excellent location score of 8.5! When would you like to stay at Plazamar Serenity Resort? This bright, air-conditioned studio has a balcony with pool or mountain views. There is a double sofa bed and a dining table. The kitchenette includes a microwave, fridge and kettle. Wi-Fi is available for an extra cost. Towels are changed and apartments are cleaned 4 days a week. Sheets are changed weekly. This studio has a dining area, kitchenette and tile/marble floor. 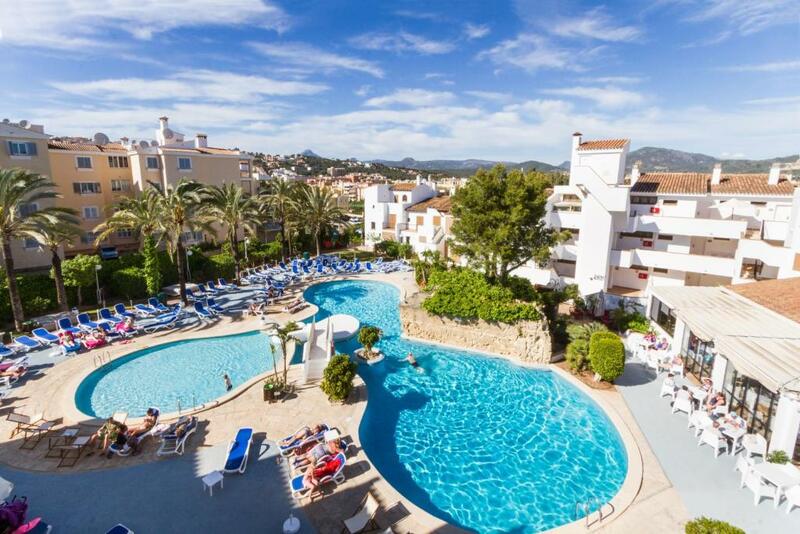 These apartments are centrally located in the popular tourist destination of Santa Ponsa a few meters from the beach. It has a beautiful pool with sunbebs around it and a bar next to the terrace where you can enjoy your drink after a bath. The area is well known because the of tourism and offers a wide variety of entertainment, bars, restaurants and nightclubs. Be sure to visit the beautiful marina a few meters. Has studios and apartments, all comfortable and well equipped. Ideal for families and couples. House Rules Plazamar Serenity Resort takes special requests – add in the next step! Plazamar Serenity Resort accepts these cards and reserves the right to temporarily hold an amount prior to arrival. There were some dust, hairs in the room on the floor. So my wife had to clean it up after arrival. We saw a few tiny ants in the bathroom but we are ok with it. We had a baby carrige and we had to up it to the room. There is a lift but you have to pass several stairs or steep slope to reach it. At the same time there is an exit just next to the room but it's permanently closed as far as I understand. There is an animation next to the pool at the evening but it was not so load during our stay in October and did not disturb us. Even though the cleaners tidied and changed towels daily the floors and shower were not cleaned during our stay. Had one meal in the restaurant downstairs and it wasnt great. For a budget resort, it was well worth the money. We went on a lads trip - but we behaved!! Lots of families there and the pool area is designed for that. Ants everywhere in the room! Kitchen needs was poor, cooking was little bit problematic. Pool was very good, clean, children liked it. Beach was only few minutes from hotel. We enjoyed the buffet food and drinks. The staff are friendly and helpful. Overall the entertainment was reasonable. The location near to the beach, restaurants and bars is excellent. Lots of shops and stores. The local shop next to reception was very good for prices of cans of juice, lager wine and water. 0.90eurocents for Coke, Diet Coke, Orange. 1 Euro for cartons of fresh juice such as Apple or Pineapple. Short walk to local transport such as buses and taxis. Outside Trips + FREE BUS; As an example Palma Aquarium can be pre booked in reception the day before but only accept cash. A great benefit is you get a free bus the next day right outside the complex and a discount on door prices.